At one time, some collectors considered these items to be old Carnival Glass--and prices seemed to reflect that. 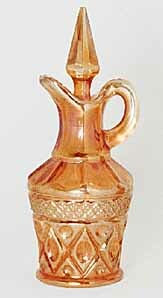 The cruet shown here sold at a 1998 auction for $225: another one sold the same year for $130. In 2012, a marigold example sold for $33. In 2018, a marigold cruet sold for $40. It was listed as Levay from 1997, 150 of 300 made. I have no records of any tumblers selling at auction. 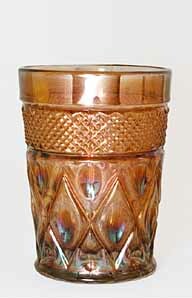 There are ice tea tumblers in a similar pattern that are known to be new. At the Imperial Convention in 1997, I had lengthy chats with several former Imperial employees, including the former plant manager & Lucille Kennedy, the long time Director of Marketing for Imperial. One of the things I asked her about was the Carnival Cape Cod items, as I at that time owned a Tumbler. Here's the info, straight from the "horses mouth" so to speak. Total......600 pieces all made for Levay Distributing. In 2013, King Hoppel sent me a photo of one of his two cruets incribed with "111-300 Levay 1977." This would seem to confirm the above comments and list.